An introduction to some of our most popular lines of bed linen for inns, motels and Bed & Breakfasts : take advantage of our trial package today ! Have you ever turned up at your holiday cottage and found that sheets weren’t included ? Or visited friends or family and found they didn’t have any spare sheets ? Don’t bother filling your suitcase with bulky bed linen which will then have to be washed when you get home. 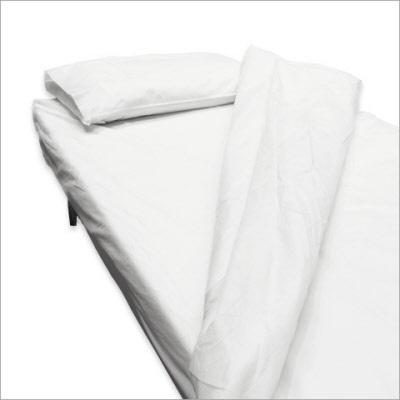 Our disposable sheets are the perfect solution : lightweight, easy to pack, quick to make up, and always clean ! Easy to use, ecologically friendly, 100% recyclable – what’s not to like ? This trial set can be used for a week or two (perhaps longer if you wish) and includes everything for one double and two single beds. • 2 Square Pillow Cases, 65 x 65 cm / 26" x 26"
• 2 additional Square Pillow Cases, 65 x 65 cm / 26" x 26"
If you wish to customise the pillow case size, please let us know in the Comments section during the payment process. Our other pillow case size options: Cushion, 45 x 60 cm / 18" x 24" and Oxford, 50 x 75 cm / 20" x 30"